Watering orchids may be the trickiest part of orchid care. In nature, orchids grow in rain forests and other wet, humid places. A special material called velamen coats the roots and allows them to rapidly absorb water. Once the rain has stopped, the roots dry out quickly because most orchids grow in loose, well-draining soil. The velamen then retains absorbed moisture until it's needed by the plant. 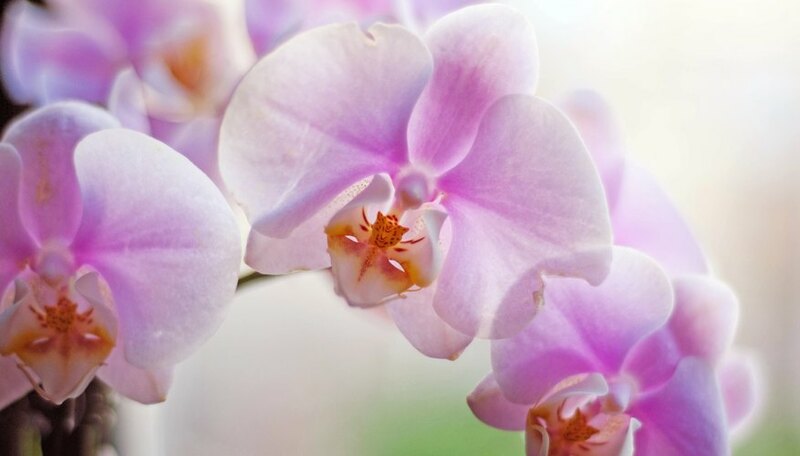 More orchids are killed by overwatering than underwatering, so providing the right amount of water is the secret to success with orchids you grow at home. The amount of water needed depends on the type of orchid. Orchids are divided into two classes: terrestrial orchids and epiphytes. Both types are sold as houseplants. Terrestrial orchids include Paphiopedilum (Paphiopedilum spp.) or lady slipper -- different from the wild lady slipper. These orchids are soil-dwelling plants and grow in a soil mix similar to regular potting soil. Most varieties grow in U.S. Department of Agriculture plant hardiness zones 6 through 9. Epiphytic orchids grow in USDA zones 6 through 11. This group includes the popular Moth, or Phalaenopsis, orchid (Phalaenopsis spp. ), and Dendrobium (Dendrobium spp.) and Cattleya (Cattleya spp.) orchids. In the wild, epiphytes grow in trees, clinging to the tree bark for support but absorbing water from the atmosphere. Epiphytes and terrestrial orchids require slightly different potting soils and providing the right potting mix is an important part of orchid care. 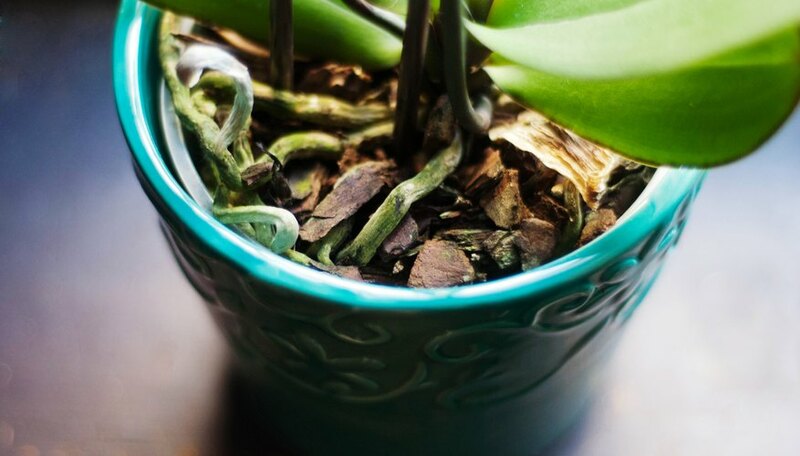 Waterlogged roots are a sure death sentence for any type of orchid. Terrestrial orchids do best in a soil mix consisting of garden loam, peat moss and clean, sharp sand. This mix allows for adequate drainage, yet provides some moisture retention. Epiphytic orchids prefer a mix that does not readily retain water, such as coniferous bark, coarse sphagnum moss, perlite and charcoal. Orchids should be planted high in the pot with the crown -- where the roots and leaves meet -- above the soil level. Water orchids with room temperature or lukewarm water so as not to shock them. 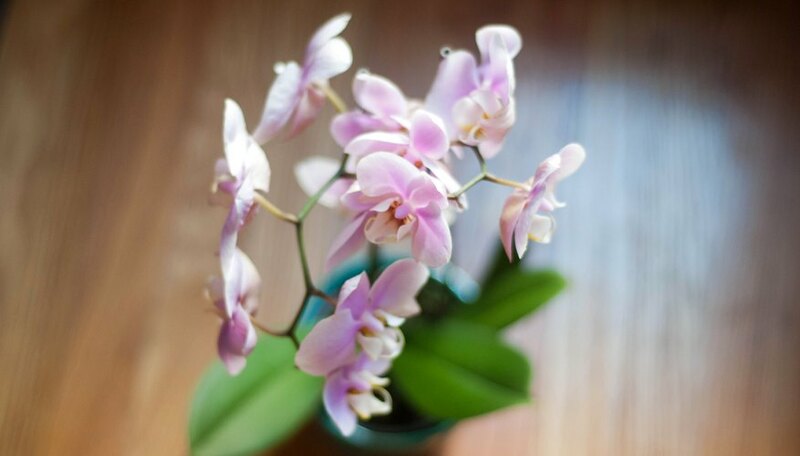 Don't use softened water -- it may contain sodium that can harm orchids in the long term. Well, tap or rainwater are acceptable. Hold the container over a sink or tub so the pot will drain. A good rule is to let the water flow over the soil for about 15 seconds, and then let the pot drain for 15 minutes. You can also place the orchid pot in a tray filled with gravel or rocks and water to increase humidity in the air around it. Terrestrial orchids need higher humidity than epiphytic orchids. 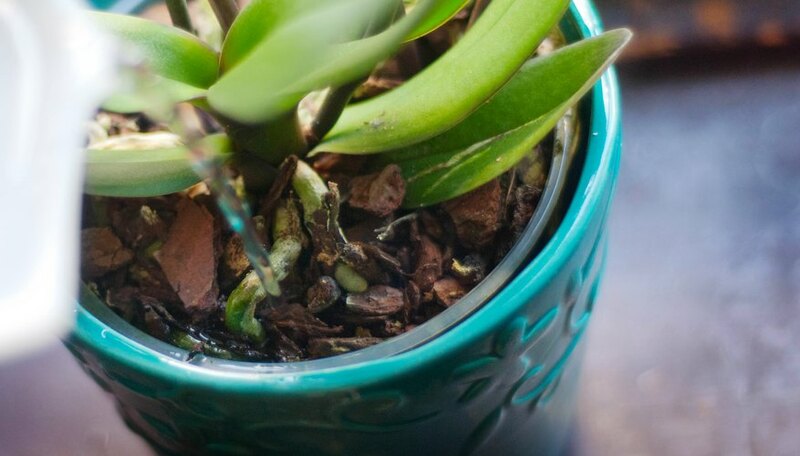 Hand mist the orchid with an atomizer to create more humidity, if necessary, but be careful not to let any water droplets accumulate in the crevices of the leaves. Water droplets that remain in the axis of the leaves can cause fungal problems. Water your orchids according to the amount of light the plants get, the humidity of the room and the temperature -- not the calendar. 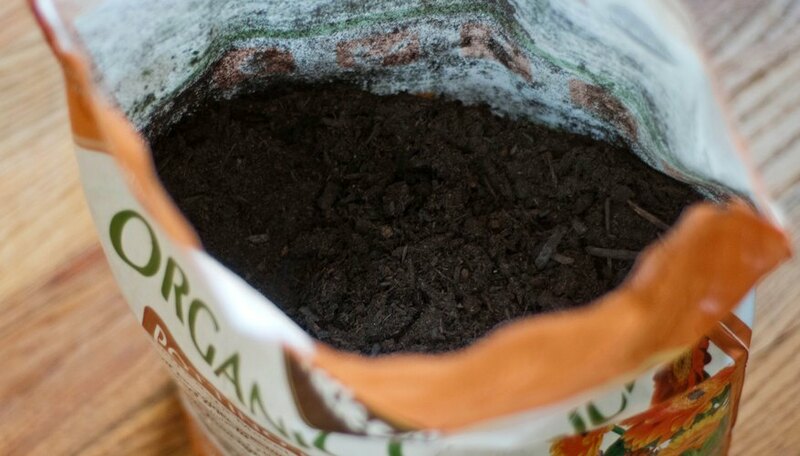 Orchid soil should remain slightly moist and should not be allowed to dry out completely. Stick a newly sharpened wooden pencil or a wooden dowel into a pot. If the fresh wood turns dark, then the pot has adequate water. You can also just test the moisture with your finger. Lift an adequately watered pot to judge the weight. Later, when the pot feels much lighter, it's time for another drink. American Orchid Society: How Do I Water My Orchid?